During the 14th week of 2019, (01.04-07.04.2019) the Republic of North Macedonia registered 283 influenza cases/flu-like diseases(I=13.7/100.000). Compared with the number of registered cases in the last week, are decreased for 40.8% (n=478) and increased for 56.4 % compared with the cases of the last season.(n=181). (chart1) and compared to the average for the 14th week of the last 8 seasons, there is an increase of 90.1% (Chart 1). The incidence this week is above the weekly limit of seasonal (low) activity of the influenza virus (Chart 1). Over the past week, there have been no deaths associated with influenza. This week, the virological laboratory of the IPH received 18 influenza testing materials, of which 7 (38.8%) were positive for the presence of the influenza virus – 1 Influenza A (H1) pdm, 4 Influenza A (H3) and 1 Influenza A is non-subtyped (Chart 5). This week most of the cases have been registered in a group 15-64 years (n=191; 67.5%)and the highest incidence is registered in persons over 65 years, I=17.9/100 000. (chart 2). This week were reported cases from 21 reporting units. Most of the cases have been registered in Gostivar (n=58)and the highest incidence is registered also there, I=48.4/100 000. (chart 1). In the 2018/2019 season, the total number of influenza cases is 20940 (I=1012.0/100.000). Compared with the same period last season , there is a decrease in the total number of reported cases by 11.5%, and in relation to the model for the last 8 seasons (n=26046) a decrease of 38.6% . Over the season, have been registered 28 deaths associated with influenza. 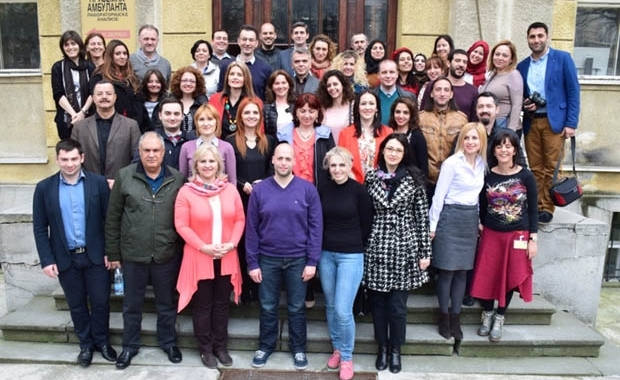 13 people from Skopje, 4 from Ohrid, 2 from Kicevo, Kavadarci, Delcevo, Tetovo, and 1 from Resen, Valandovo and Kriva Palanka. In 20 people (71,4%), pre-chronic disease has been identified, ie co-morbidity.The age of the deceased ranges from 5-86 years. According to records presented in Flu News Europe (13th week/2019), the activity of influenza virus in Europe is the following: 38% samples were confirmed as positive. (from the sentinel surveillance tests in countries reporting to the TESSy system of the ECDC). From the beginning of the 40th week, over 90% of influenza A viruses detected by SARI (severe acute respiratory infection) cases were subtyped, and 80% of them were A (H1N1) pdm09. In general, current influenza vaccines tend to act better against influenza A (H1N1) pdm09 and influenza virus B than against influenza A (H3N2). Preliminary assessments of the effectiveness of the vaccine continue to support the use of vaccines. Initial data suggest that vaccines are effective, but estimates vary depending on the population surveyed and the proportions of subtypes of circulating viruses. The data from Member States reporting to EuroMOMO show that increased mortality in persons has returned to normal. Increased mortality is noticed in the age group over 65 years and less in the age group of 15-64 years.